It's easy to tell when your car has a rough idle: When you start the engine, it won't run at a steady rate. It may almost stall, or it may run at varying RPMs without your putting your foot on the gas, or it may do both. There can be a variety of reasons why your vehicle is idling roughly. The downsides can be reduced fuel economy, poor performance, starting issues or potential major engine problems in the near future. It's best to try to diagnose and fix a rough idle before it gets worse — and before it gets expensive. Here's the RepairPal guide to rough idling, what can cause it, and how to fix it. When you start your engine, and just let it run without pressing on the accelerator or putting it into gear, that's idling. A properly idling engine should be able to maintain a steady but low rate of revolutions, somewhere in the vicinity of 1,000 RPM. Your tachometer needle should be steady and not jumping around. An engine that is idling smoothly provides enough power to operate your vehicle's basic systems like the power steering, electrical system and cooling system. Smooth idling indicates that your engine is getting the correct mixture of air and fuel to burn. If your car's idle is rough, possibly rising and falling, or struggling to maintain a steady rate of rotation, you may have a problem that needs fixing. Since a smooth idle depends on just the right mixture of fuel and air, there can be many possible places where that combination is getting unbalanced. Some of these causes can be simple, and some can be complicated. An accurate diagnosis is very helpful in these cases, so taking your car to a mechanic will let you know exactly what is going on and how best to resolve the problem. Try to figure out what the exact circumstances are when your vehicle's idle is rough. Does it happen on cold starts, after the car has been parked for hours? Does it happen when you restart a warmed-up car? Does it happen all the time? Are there any odd noises? Do you see any smoke coming out? Take notes on anything that you think might help your mechanic narrow things down. Vehicles made in the past couple decades have sophisticated engine computers that monitor the operation of the fuel, combustion and exhaust systems. This is primarily to make sure that the emission controls are working properly, but a rough idle can cause a malfunction code to be sent to the computer. If this happens, your check engine light on the dashboard will light up. Your mechanic can then use a code reader to identify the specific problem, and then determine if that malfunction is what's causing the rough idle. If this does not identify the issue, further investigation will be necessary. Many different problems could result in a rough idle for your car or truck, including: dirty fuel injectors, clogged air filters, bad spark plugs, and a variety of exhaust system issues. Let's go over each of these causes in more detail and learn how they can be remedied. Today's emission controlled engines are extremely fuel-efficient, using high-pressure fuel injectors to precisely spray the exact amount of fuel into each cylinder at just the right moment. Your fuel injectors operate in a very hostile environment, with high temperatures and fuel pressures. The injectors' spray nozzles have tiny openings, which can get clogged from the carbon that is a byproduct of the combustion process. This leads to less fuel going through the injectors, leading to worse performance and possibly rough idling. Solution: If this is the problem, your mechanic can remove the injectors and physically clean them using a combination of very powerful solvents and high pressure. One easy way to keep your fuel injectors cleaner longer is to use Top Tier gasoline or diesel fuel, which has a high concentration of detergents to keep carbon deposits from forming in your engine. You can find which fuel brands offer Top Tier fuel here. Another option is to try to clean your fuel injectors with a fuel system additive like Techron, or something similar. While an additive may or may not have much effect on your rough idle problem, you can consider this as a last-ditch effort before visiting your mechanic. Follow the directions on the product's label. Spark plugs, the wires they are connected to, and the coils that generate high voltage are all responsible for delivering the electrical impulse that ignites the fuel and air mixture in each cylinder of your engine. Spark plugs left in too long without being replaced can become fouled with carbon deposits, oil or ash from the combustion process, reducing the amount of power that is produced when the plug ignites. Plugs not changed at proper intervals can also result in worn electrodes, which create a larger than normal gap. This requires more voltage to operate and can damage other ignition-related components. These conditions can cause a rough idle, as well as many other engine problems. Solution: The first step is to remove your spark plugs and take a good look at them. Their condition can help to diagnose the nature of the problem that is causing your rough idle. Carbon deposits may indicate a too-rich mixture or a spark that is not strong enough. Oil deposits can mean that your piston rings are worn or your valves are leaking. Ash deposits might tell you that you are using poor quality fuel or that you have an oil leak. The gap, or distance between the electrodes on each plug, should also be checked with a feeler gauge. Each should be set for the correct gap specified by the manufacturer for proper performance. And remember to replace your spark plugs at the manufacturer's recommended interval. Spark plug wires can also be the source of a rough idle. Many vehicle manufacturers recommend replacement of spark plug wires every few years to maintain their level of performance. Check your owner's manual for the correct replacement interval. A mechanic can check the wires' resistance to verify whether they are operating properly. Ignition coils can also malfunction, causing misfires in the ignition system. These will likely trigger your check engine light. A code reader can be used to check the trouble codes that are generated by the misfiring problem. Keep in mind that if your check engine light blinks, you should shut off the vehicle immediately, and not drive it again until the problem is fixed. Your engine's air filter has an important function. It is there to keep dirt, dust and other foreign matter from entering the engine. Most engine air filters use a folded paper element, which can become clogged if not changed at the appropriate interval. Most carmakers suggest a yearly air filter replacement. Check your manual for this information. It is just as important for your engine to get enough air as it is for it to have enough fuel. A clogged filter will reduce the flow of air into the engine, causing a rough idle. It may also increase your fuel consumption. Solution: Replacing your air filter is a simple process of removing the old one and replacing it with a new filter. It is important to clean the filter housing of any accumulated dirt that is in there before you close it back up. Your engine's positive crankcase ventilation (PCV) valve is responsible for taking unburned "blowby" gases that escape from the cylinders into the crankcase, and sending them back into the engine to be burned completely. The PCV valve works in an extreme environment in your engine, and over time can get filled with sludge and dirt. This can cause the valve to become blocked and inoperative, or it may start to leak. A PCV valve leak can cause the air-fuel mixture to run too lean, and this will cause a rough idle. Solution: Proper periodic servicing of the PCV valve will prevent this situation from occurring. The fix is to service the valve regularly and make sure that it is clean and fully operational. The exhaust gas recirculation (EGR) valve sends some of the engine's exhaust gases back through the intake system to lower the vehicle's emissions. 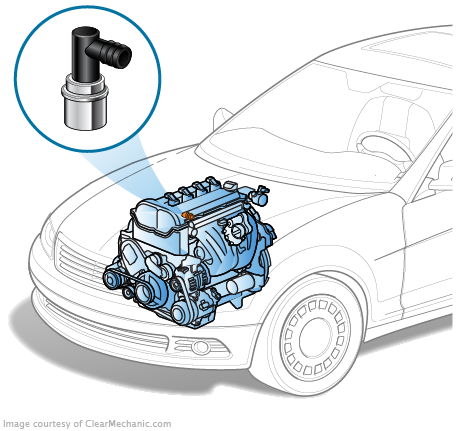 Over time, the EGR valve can fail in the open or closed position. An EGR valve that is stuck open can result in an air-fuel mixture that is too lean. This can cause a rough idle. Solution: A vacuum pump can be used to test whether the EGR valve is operating properly. A faulty EGR valve may also cause your check engine light to come on, in which case a code reader may reveal the culprit. Your oxygen sensor is part of your vehicle's emissions system. It protrudes into the exhaust system, continuously monitoring the oxygen content of the exhaust. It sends this information to the engine computer, which uses it to maintain the correct air-fuel balance for efficient and clean combustion. The oxygen sensor can be adversely affected by the high temperature environment it works in. It can become covered with carbon deposits or simply wear out. When this happens, it sends incorrect information to the engine computer. The engine can run too rich or too lean. A too-rich mixture will result in poor fuel economy. A too-lean mixture will cause a rough idle. Solution: Since the oxygen sensor is part of the emissions system, its failure will usually trip a trouble code in the engine computer. A code reader can be used to identify the problem, and a digital multimeter may help to determine whether the sensor has failed and needs replacement. Solution: Listen for a hissing sound that can lead you to the source of the problem. This situation can also turn on your check engine light, with a lean-mixture trouble code triggered in the engine computer. This code can lead you to the cause. If your vehicle has over 100,000 miles on it, and the source of your rough idle can't be traced to one of the more common causes, you may have a more serious problem. You may have a compression issue that is related to engine wear — a compression test can help identify this. There may also be other major components that have worn out and failed, which can require some major repairs. Today's cars all have highly efficient, very reliable fuel injection systems and electronic ignition systems to control combustion. But many cars from the 1980s and earlier model years used carburetors to meter the air and fuel going into their engines. They also used mechanical ignition systems. If you're experiencing a rough idle in an older vehicle with a carbureted engine, the process is a little different. Cleaning out the carburetor to remove carbon deposits is probably a good place to start. Then you should check all the vacuum hoses — a leaking hose can cause a too-lean mixture and a rough idle. Other places to check in older vehicles are the distributor cap and rotor in the ignition system. These parts tend to wear from normal operation, and can affect the vehicle's idling quality. A good mechanic will try to find the exact cause of the problem quickly and fix it. A great first step is to check the engine computer and see what codes have been triggered. These codes can lead the mechanic to the cause and suggest a fix. If the cause is not so obvious, the mechanic will check the "usual suspects." This will include verifying that the relevant electronic parts are working properly, the valves and sensors are clean and operational, the hoses are not cracked or leaking, the spark plugs and their wires are in good condition, the air filter is in good shape, and so on. Your rough idle could be caused by one of these items, or possibly by a combination of them. Once the culprit has been repaired, cleaned or replaced, your vehicle should be idling smoothly and running well once again. To keep it that way, remember to do your scheduled maintenance at the intervals recommended by your vehicle's manufacturer.